Exciting New Apple Headquarters Pictures Unveiled! 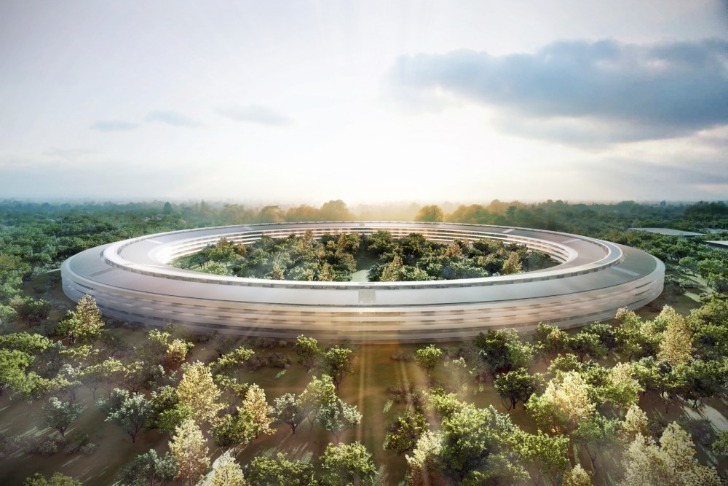 Apple Unveils Exciting New Pictures of Its Foster & Partners Designed Green Headquarters in Cupertino! We've all been waiting with bated breath to see pictures of Apple's design for its new green headquarters in California, and we're excited to say they're finally out! The city of Cupertino has unveiled official renders submitted by Steve Jobs to the community for approval. The plans reveal that Foster & Partners will indeed lead the design team, which will also include ARUP and Kier & Wright, a local engineering firm. Click on through our gallery for a closer look at this extraordinary self-sufficient curved glass building encircling an envy-inducing green space for the employees. Not surprisingly, Foster & Partners’ design for Apple’s new campus is exciting and bold but pricey. It will consist of a 260,000 m2 office building that will house up to 13,000 employees, a corporate auditorium fit for roughly 1,000 people, a corporate fitness facility, and a 28,000 m2 research and development park. Special glass will have to be developed for the circular design, which also facilitates natural ventilation, while energy self-suffiency will be achieved by an on-campus power plant. Although we’re guessing Apple will go alternative, the details of how the company plans to generate its power have yet to be revealed. Work-weary employees will be able to rest in all kinds of carbon-absorbing, uplifting green respites throughout the campus which, reportedly, has already received the go-ahead from California’s Cupertino municipality. Apple fans should prepare for takeoff around 2015! That is a very constipated design but reflecting the closed and controlling nature of Apple's culture. A big round mistake. Don't believe this green lie. There is an entire towns worth of current buildings, roads and parking,lawns and trees in this area, including some buildings that have been remodeled in the last three years. There can be no true green plan that would allow for the incredible waste that will be generated by this demolition. This is Steve Jobs Taj Mahal, or mausoleum built to his ego, nothing more. Is this another round of Feudal Lords and Serfs? Did not we already play this game? Ah, Aesthetics!! Yes, those castles with the pretty turrets, remember? A great idea if majority are playing a complementary, voluntary game. Doubtful, though, on this dimension, this planet, this materialistic, status-driven culture. I too have visions of utopian societies dancing in my head, but my visions are only inviting to those well and truly into the Buddha-like states, truly on the path to Nirvanaa. Interested to hear how a big glass doughnut is "green" I am guessing the long bands near the freeway represent the power station. Are they gonna knock down all those other buildings? Ain't the greenest building the one yer in? 20 years in the previous campus seems like a short time, kinda reminiscent of the modern throw-away culture that we live in. How many I-gadgets are obsolete and in the trash, uh, recycled already? The truth is few buildings are built with an expected life span of more than 20 years. If Mr. Jobs really wants to create a building that a visionary like himself can be proud of, how about a flexible enough design intended to last, say, 100 years. If there is anyone around who could do it, I should think he could. I love the look of the circular building; Modern and elegant. They spent 160 million dollars on the land. The new campus design will take 3 to 4 years, and the project cost is estimated at USD 500 million. Apple barely stayed in it's original campus for more than 20 years before deciding to abandon it. Besides the giant circle there will be additional buildings such as an auditorium, R&D facilities, a fitness center and a dedicated generating plant. It's interesting, at least they gave us better pictures than the previous blurry ones. Still all and all the building seems rather faceless and ominous. Rather intimidating for all the natural surroundings. Finally, the new Apple headquarters images have been unveiled. The mammoth campus will have enough office space for up to 13,000 employees! The corporate auditorium will fit roughly 1,000 people. The building's shape is so unique in fact that they will have to make the glass especially for this project. The spaceship-like building will encircle a lush green courtyard. We assume it will be an alternative plant, but no details have been revealed. And Foster & Partners will be at the helm to ensure that the planned 2015 takeoff happens on time!